Most flat panel displays, otherwise known as LCD monitors, use fluorescent backlight to provide illumination for their screens. But NEC has a new way to provide backlight, using light emitting diodes, or LEDs, evenly lighting the screen of its 2180UX-WG display. Although its decidedly high-end price of $6,500 will scare away most consumers, seasoned professional content creators whose lifeblood is accurate color will be delighted to see the precision with which this product can reproduce more colors than anybody?s ever seen on a monitor. NEC sent us a prototype of the 2180UX-WG for this First Look. The first question I had when I was unpacking this 21.3", 20.5 lb. monitor was, why? Aren?t flat panel displays with fluorescent backlights good enough? We?ve tested some spectacular-looking monitors here at the Midwest Test Facility, with ultra-sharp screens and lightning-fast refresh rates. Those monitors are perfectly suited for almost all the work we do here. But there?s one area where they aren?t perfect, and that is in accurate color reproduction. That?s where NEC has figured out how to make LED backlights that emit the perfect color of light to render colors more accurately than any monitor has been able to do thus far. Another reason NEC began developing this LED backlight technology was because of environmental considerations. Mercury is present in fluorescent backlights, and some regulations in Europe and California are beginning to restrict shipment of products that contain that heavy metal. NEC?s thinking is that if for some reason a country or a larger region were to prohibit shipment of products containing mercury, the only kind of flat panel display that would be possible would have to use LED backlights. In case a regulation like that becomes law, NEC is ready. Beyond those environmental considerations, NEC?s engineers realized the need for more accurate color reproduction, no matter what type of monitor was being used. 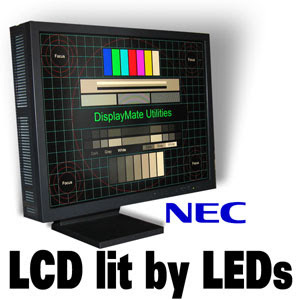 The result was this LCD technology lit with LEDs, the first computer monitor using this technology, and certainly the first with this level of color accuracy. NEC is aware that, at these prices, this technology will first be used by a niche market, realizing that average users probably don?t have a need for this level of color accuracy. NEC made this first LCD/LED monitor for those who focus on high-end 3D modeling, scientists, astronomers and graphic designers, and it?s also targeting the medical, broadcast and digital film markets as well. NEC?s route to color perfection is done with 48 LEDs, strategically placed across the back and top of this monitor (see graphics beow). 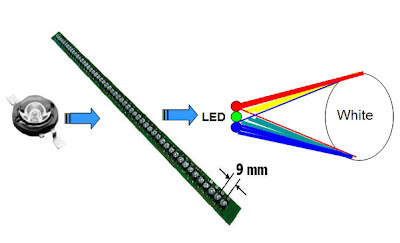 Using over a billion calculations, NEC engineers picked the 48 LEDs that would match the same color spectrum. The result is a complete lack of hotspots, where when we looked at the monitor using the DisplayMate (a special standardized script of test graphics specifically designed to evaluate all kinds of monitors and projectors) white and gray screens, the display was evenly illuminated from one edge to the other. Another advantage of using LED backlights is that they last a lot longer than standard fluorescent lamps. The particular LEDs inside this monitor will last 100,000 hours, compared to the 30,000 to 50,000 hours of ordinary fluorescent lamps. That would equal more than double the average lifespan of a typical flat panel display. NEC also says its display is more stable than most conventional monitors, and where some monitors require graphic artists to calibrate their display once every hour, this unit is more stable, not requiring calibration as often.